After missing the Essex GP to race in France, Chris Newton opened his defence of the Premier Calendar title with a repeat of his '98 win in the Europa Two-Day. TWO days of tough racing saw Linda McCartney team rider Chris Newton score his second win in successive years in the Europa Two-Day Road Race, the second round of the BCF Premier Calendar series, at Bishop's Waltham, Hampshire. Newton, second to New Zealander Gordon McCauley (Team Men's Health) in Saturday's opening stage, outpaced McCauley in the individual time trial on Sunday, when Jon Clay led a McCartney one-two. A bonus for fourth place on the final 83-mile leg was enough to give Newton the overall verdict over McCauley, who nevertheless leads the Premier Calendar rankings after his second place in Essex. And while Newton and his colleagues came away with the major honours, all the teams had their moments and contributed to an excellent race. With the backing of Bishop's Waltham Parish Council, sponsorship from Hendy Truck Centre and Frans Maas (UK), as well as help from Southampton Ford Dealers and excellent cooperation from Hampshire Police, the 27th Europa Two-Day was a resounding success. And with the local population enjoying the racing on their doorsteps, organiser Derek Witt looks sure of a welcome return next year. Top-class racing was the order of the day: "I have never seen this standard of team riding in a British event before," said chief commissaire Mark Kirby, "all the teams rode like pros." Bright sunshine encouraged immediate action, with Tim Buckle (Team Men's Health) storming away as the race proper began after a fourmile run from Bishop's Waltham to the circuit at Stephen's Castle. Buckle pushed on and, with five miles under his belt, led by 43 seconds as the bunch at last began to react. On the climb at Owslebury, Buckle was joined by the formidable duo of former national title holder Jeremy Hunt (Banesto) and world junior pursuit champion Bradley Wiggins (Adidas-SciCon). Buckle lost his place in the break, unable to match the speed of his companions. "I will have to learn to descend," he admitted later. However, he closed back up each time and the trio pressed on, stretching out their lead to 70 seconds as the race approached half distance. But then, with the Linda McCartney and Harrods boys leading a serious chase, the bunch closed at a rapid pace and within 10 miles the break was caught. Immediately another move went away, and Hunt and Buckle were there again along with Chris Newton, Paul Manning (Adidas-SciCon) and Julian Ramsbottom (Harrods). A three-mile chase followed as seven others left the fragmenting bunch - Heiko Szonn and Jon Clay (Linda McCartney), Gordon McCauley, Tim Bayley (Arctic 2000 RT), Jon-Kris Mason (Long Eaton CC), Rob Hayles (Doyle PursuitsNike) and Charlie Wegelius (SG Bollington). At 50 miles the two leading groups merged and left 12 riders 45 seconds clear. McCauley looked strong, and he was soon testing his companions when he attacked after Owslebury. Wiggins quickly latched on to him as the break split, with Manning having trouble at the back. Ramsbottom led the chasers back up to McCauley and Wiggins, and for a few miles there was harmony in the break. On the final eight-mile lap, as they climbed Owslebury, it was again McCauley causing the trouble. Only Newton and Szonn were able to match the Kiwi. Just as they went clear, Hunt lost his chain and had to dismount. By the time he had put the chain back on, McCauley, Newton and Szonn were long gone. The trio quickly moved away, and within a mile were 25 seconds ahead. Newton led from Szonn and McCauley as they wound it up. A gap opened as Szonn eased back, taking McCauley with him and leaving Newton out on his own as the final drag up to the finish began. McCauley was unperturbed. As he said later: "I just waited and jumped Szonn, and then passed Newton. I wasn't worried - I knew I had the edge over Newton in an uphill sprint." Former national 10-mile time trial champion Jon Clay (Linda McCartney) showed he has lost none of his ability when it comes to racing against the clock. Clay took just 7-50 to cover Sunday's time trial leg of just under four miles to beat team-mate Chris Newton by a second, while stage one winner Gordon McCauley took third, three seconds off Clay's pace, to foil a Linda McCartney clean sweep of the top placings. The short effort took the riders - in reverse order of the stage one result - around Bishop's Waltham with the start and finish in the narrow high street. The technical course didn't suit everybody. British Best All-Rounder Kevin Dawson (Harrods RT) finished down in 24th place in 8-39, national hill-climb champion Jim Henderson (Terry Wright Cycles) managed to lose 1-06 on Clay, Jeremy Hunt lost two minutes and Bradley Wiggins could manage only 15th place with 8-28. While Clay had cause for celebration, his triumph nearly turned to disaster. After crossing the line he collided with a race official and injured his shoulder. Overall, McCauley kept the lead but Newton was just three seconds behind him, followed by Szonn at 14 seconds and Clay at 38 seconds. Sunday's road stage was the longest stage, at 87 miles, and also the toughest, with the mile-long climb away from Meonstoke to be tackled eight times. McCauley and his Men's Health colleagues clearly had their work cut out with three McCartney riders hard on their heels. As soon as the flag was dropped after the high street departure, the race was on, with nine riders immediately going clear. Jeremy Hunt was there, along with Joe Bayfield (Harrods RT), Matt Illingworth (Linda McCartney RT), Danny Axford (unattached), Justin Clarke (Men's Health) and Rob Hayles. An early retirement took GP of Essex winner Chris Walker (Linda McCartney) out of the race, overnight sickness leaving him unable to continue. After Meonstoke, the bunch pulled the break back, but again Hunt attacked, this time taking with him Brian Fleming (Arctic 2000 RT), Rowan Horner (VC St Raphael) and Andy Collis (Lichfield City CC). Over the long climb, 10 chasers took up the pursuit, followed a couple of miles later by another trio that included national road champion Matt Stephens (Harrods). With 28 miles covered, 23 riders formed the leading group on the road, but the yellow jersey of McCauley was not there. 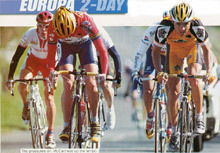 Two of his team-mates, Clarke and Matt Beckett, had infiltrated the break, but the McCartney squad had Newton, Szonn and Illingworth while Arctic 2000 had Tim Bayley, Fleming and Darren Barclay in the break. Romford-Harlow winner Martin Ford (Team Lease Direct) was also there, along with Matt Stephens and team-mate Mark McKay, Bradley Wiggins and Paul Manning (AdidasSciCon), Charlie Wegelius and junior road champion Yanto Barker (SG Bollington), Hayles, Ian Humble (Amore e Vita), Bryan Steel (CCA Eurotel-Deeside) and Scott Gamble (Brookes-Nuffield-Raleigh). The lead group was too big to have much cohesion, and a split was forced over Meonstoke with Newton, Clarke, Hunt, Barclay, Stephens, Hayles and Wegelius going away. On the flatter roads, the leaders regrouped. Heading through Bishop's Waltham High Street, Hunt set the pace and was quickly joined by Stephens and Illingworth. The trio soon had 40 seconds on their former companions, but McCauley, his team-mates and other interested parties were intent on closing the gap. Up front, Illingworth was following manager Keith Lambert's instructions by not working. Meanwhile, a seven-strong group was in pursuit - Andy Lyons (Arctic 2000), Horner, Danny Axford, McKay, Barclay, Gary Dodd (Festival RC) and Gamble. McCauley was back in the bunch at 1-45, while the seven were at 50 seconds. Barclay, Stephens and Illingworth were all closing on the overall standing of McCauley. With 24 miles remaining, Hunt's group still had 50 seconds on the seven, with the yellow jersey bunch at 1-50. When the front trio's lead went out to two and a half minutes, Lambert came up to tell Illingworth to join in the pacemaking. Over the climb from Meonstoke for the last time, the gap was down to 1-20 as the bunch steamed along, driven by McCauley's squad and the Arctic 2000 boys. The McCartney team now began to attack McCauley, Newton trying unsuccessfully to escape. Then Szonn jumped, and again it was down to McCauley to stop him. Meanwhile, Hunt had taken the front in the run-in to Bishop's Waltham. With a sharp left-hander followed by right-hand turn there was little chance for anyone to get past the Banesto man at the front, and he rode to a deserved stage win ahead of a fast-finishing Stephens and Illingworth. But the battle for the race was still on, and Newton had to get fourth-place and the time bonus to be the winner overall. Jon Clay made sure he did, giving his team-mate an ideal lead-out from 300 yards out. 20. M. Larner (Lichfield City CC) at 3-22. Team.- Linda McCartney. Sprints.- Jeremy Hunt. CHRIS Newton put his latest Europa Two-Day win down to good teamwork; "The whole team rode very hard for me over the two days, and even though we lost Chris [Walker] we managed to keep control," he said. "With Matt Illingworth in the break, the pressure was off me on stage three. If they had got over three minutes, Matt would have been up for the overall win. "We kept attacking McCauley on the last lap, especially on the final climb. He had to keep closing gaps. We knew we had to stop him getting any time bonuses. Jon [Clay] gave me the perfect lead-out and I got the bonus I needed. "I'm beginning to go better. We have some foreign trips coming up, so I'm looking forward to them." GORDON McCauley was philosophical in defeat. "Well, they say you win some and you lose some, but in my case it should be you lose some and then you lose some more! was third in the March Hare and second in the GP of Essex, and now I'm second again. "The boys worked really hard for me today. We're off to race in Belgium over Easter - we need some hard racing if we want to ride the Prutour."